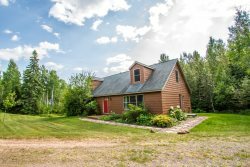 Amazing views from this extremely private retreat located near Lutsen Mountain, Superior National Golf Course, Gitchi Gami Bike Trail, and more. Cathy's Cove is a recently redecorated, private North Shore Retreat on an idyllic section of Lake Superior Shoreline. The cabin sits on 425 feet of ledge rock shoreline and is directly on the Gitchi Gami Bike Trail. You will love the small seasonal waterfall that drops 30-40 feet into the cove below, which is visible from the cabin's deck. This cozy little one bedroom, one bathroom, one story cabin sits on 3 acres providing a peaceful, serene getaway on Lake Superior's North Shore. On the western side of the property you will find a staircase leading to the ledge rock "peninsula" down to a private, seasonal waterfall. This is a shoreline that is truly unique to Cathy's Cove. At Cathy's Cove you are just a short drive away from the beautiful Oberg Mountain Scenic Overlook and hiking trail, a must-see during leaf changing season. Head down the shore and check out Temperance River State Park or head up the shore and you will find Cascade River State Park - both great for hiking and enjoying some beautiful waterfalls. The Gitchi Gami Bike Trail is nearby and runs along Highway 61. The trail is enjoyed by bikers and walkers alike, taking a scenic ride or stroll along Lake Superior's shoreline. The Lutsen Mountains recreation area is just 10-miles away and offers both winter and summer activities, including skiing, the alpine slide, and a scenic gondola up to the Moose Mountain Summit. Enjoy the many restaurants and live music offered year-round on the mountain, as well. Be sure to take a day trip up to Grand Marais to enjoy the quaint town and its many small shops and unique restaurants. Whether you've come to relax or come to explore and have an adventure, Cathy's Cove is a great home base! Cathy's Cove is an awesome property. Great location and access to lake is huge bonus. This was our 2nd stay at Cathy's Cove and we can't wait to come back! We loved the new stairs down to the lake, this was a big improvement. The best part is that the property is dog friendly. There are beatiful state parks very close to the property but you don't need to go anywhere the view from the deck is great too. Beautiful location - overlooking Lake Superior. Watched the ice chunks bumping with the wind, then break up and out of the cove. Really amazing to watch the lake change with the weather. We could hardly keep our eyes off the lake. We were at Cathy's Cove three days. Deer were bedding down right next to the cabin, along with a family of grouse - and eagles made a frequent appearance. And a very comfortable bed! A wonderful little rustic cabin perched on the edge of a cliff with it's own private waterfall and miles of cross-country trails a short drive away. My wife and I had a relaxing, cozy time! It was a charming cabin. We were pleasantly surprised at how cozy it can be, even on a chilly evening. The weather was lovely and we grilled out a few nights and spent the afternoons out on the deck that runs all across the lake side of the cabin. We would recommend a bath mat for the tub as it was a bit slippery. Cathy's Cove was in a beautiful location, overlooking the lake with a staircase to the lake front. Every thing in the home was well cared for. This was our "home" for a great trip. The only negative was once it was dark out finding the drive was extremely difficult. Thanks very much for a great time. We absolutely loved it!!! Cute cozy cabin with a great view! Cathy's Cove exceeded expectations. The cabin was roomy and lovely, with a wonderful wood stove that also acted as a regular fireplace. The grounds (especially the Cove itself) were quite a surprise. Not only can you see the waterfall, you can actually walk into the waterfall, which was a special treat. We will strongly recommend this cabin to our friends and colleagues.